Steve Ritchie was born on June 25, 1942, in Reidsville, North Carolina. He entered the U.S. Air Force Academy on June 27, 1960, and was commissioned a 2d Lt on June 2, 1964. Lt Ritchie next completed Undergraduate Pilot Training, and was awarded his pilot wings at Laredo AFB, Texas, in August 1965, followed by service as an F-104 Starfighter pilot in Flight Test Operations with Air Force Systems Command at Eglin AFB, Florida, until 1967. After completing F-4 Phantom II Combat Crew Training, Capt Ritchie deployed to Southeast Asia, where he flew 195 combat missions with the 480th Tactical Fighter Squadron of the 366th Tactical Fighter Wing at Da Nang AB, South Vietnam, between 1968 and 1969. During this time, he flew the first F-4 Fast FAC mission. His next assignment was to F-4 Fighter Weapons School at Nellis AFB, Nevada, followed by service as an instructor at the school until January 1972. He then deployed to Southeast Asia for a second tour, this time flying with the 555th Tactical Fighter Squadron of the 432nd Tactical Reconnaissance Wing at Udorn Royal Thai AFB, Thailand, from January to September 1972. During this time, Capt Ritchie flew another 144 combat missions, and was credited with the destruction of 5 MIG-21 fighters in aerial combat, making him the only Air Force ace pilot of the Vietnam War, and the last American pilot to become an ace. He left active duty and joined the Colorado Air National Guard in April 1974, and transferred to the Air Force Reserve in 1984. 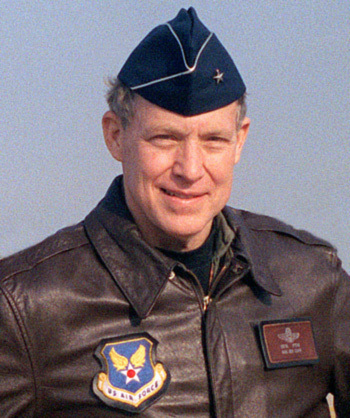 Gen Ritchie retired from the Air Force Reserve on February 9, 1999. The President of the United States of America, authorized by Title 10, Section 8742, United States Code, takes pleasure in presenting the Air Force Cross to Captain Richard S. Ritchie, United States Air Force, for extraordinary heroism in military operations against an opposing armed force as an F-4D Aircraft Commander, 555th Tactical Fighter Squadron, Udorn Royal Thai Air Force Base, Thailand, in action on 28 August 1972. On that date, while leading his flight to its assigned position deep in hostile territory, Captain Ritchie engaged and destroyed a hostile aircraft while it was attempting an attack on another flight of allied aircraft. Through superior maneuvering and use of aircraft capabilities, and in complete disregard for his own safety, Captain Ritchie was successful in destroying his fifth North Vietnamese MiG-21. 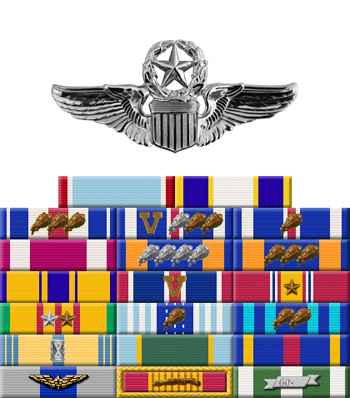 Through his extraordinary heroism, superb airmanship, and aggressiveness in the face of the enemy, Captain Ritchie reflected the highest credit upon himself and the United States Air Force.